Crystal Reports 9 Professional Edition includes productivity and data connectivity tools for powerful report design. 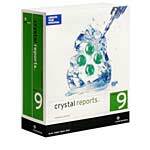 Crystal Reports 9 Developer Edition provides rapid report creation and integration. The Developer Edition includes the report design features of the Professional Edition plus application integration tools for creating and integrating reports into basic Windows applications and web applications. Crystal Reports 9 Advanced edition includes the complete Crystal Reports feature set plus more web flexibility for data access, runtime report design and deployment.